After Convergent and now single again, I was a co-founder of my next two startups; MIPS and Ardent. I threw myself into work and worked even more hours a day. And while I had great adventures (stories to come in future posts,) by the time I was in my mid-30’s I knew I wanted a family. (My friends noticed that I was picking up other people’s babies a lot.) I didn’t know if I was ready, but I finally could see myself as a father. I met my wife on a blind-date and we discovered that not only did we share the same interests but we were both ready for kids. My wife knew a bit about startups. Out of Stanford Business School she went to work for Apple as an evangelist and then joined Ansa Software, the developer of Paradox, a Mac-database. Our first daughter was born about four months after I started at SuperMac. We ended up sleeping in the hospital lounge for 5 days as she ended up in intensive care. Our second daughter followed 14½ months later. We would have a family dinner at home most nights of the week. Regardless of what I was doing I had to be home by 7pm. (My kids still remember mom secretly feeding them when they were hungry at 5pm, but eating again with dad at 7pm.) But we would use dinner time to talk about what they did at school, have family meetings etc. Weekends were with and for my kids. There was always some adventure on the weekends. I think we must have went to the zoo, beach, museum, picnic, amusement park, etc. a 100 times. Traditions matter. Holidays, both religious and secular, weekly and yearly, were important to us. The kids looked forward to them and we made them special. Document every step. Like most dads I took thousands of photos. But I also filmed the girls once a week on the same couch, sitting in the same spot, for a few minutes – for 16 years. When my oldest graduated high school I gave her a timelapse movie of her life. When I was in my 20’s the two concepts that mattered were, “me” and “right now.” As I got older I began to understand the concept of “others” and “the future.” I began to realize that working 24/7 wasn’t my only goal in life. As I got older I began to realize that how effective you are is not necessarily correlated with how many hours you work. My ideas about Customer Development started evolving around these concepts. 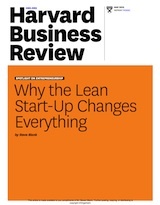 Eric Ries’s astute observations about engineering and Lean Startups make the same point. I began to think how to be effective and strategic rather than just present and tactical. As my kids were growing up I got a piece of advice that stuck with me all these years. The first was when our oldest daughter was 6 months old, and a friend was holding her. She looked at the baby then looked at me and asked, “Steve do you know what your most important job with this baby is?” I guessed, “Take care of her?” No. “Love her?” No. “OK, I give up, what is my most important job.” She answered, “Steve, your job is teaching her how to leave.” This was one of the most unexpected things I ever heard. This baby could barely sit up and I have to teach her how to leave? For the next 18 years that thought was never far from my mind. At some point I had heard two aphorisms which sounded very trite when I was single but took on a lot more meaning with a family. This life isn’t practice for the next one. I started to realize that some of the older guys who I had admired as role models at work had feet of clay at home. They had chose their company over family and had kids who felt abandoned by their dads for work – and some of these kids have turned out less than optimally. I met lots of other dads going through the “could-have, would-have, should-have” regrets and reflections of the tradeoffs they had made between fatherhood and company building. Their regrets were lessons for me. What will your epitaph say? When our kids were babies I was still struggling to try to put the work/life balance in perspective. Someone gave me a thought that I tried to live my live my life around. He asked me, when you’re gone would you rather have your gravestone say, “He never missed a meeting.” Or one that said, “He was a great father.” Holding my two kids on my lap, it was a pretty easy decision. When my last startup, E.piphany went public in the dot.com boom, I was faced with a choice; start company number nine, or retire. I looked at my kids and never went back. Thanks to my wife for being a great partner. It takes two. Steve – Great post. Too few entrepreneurs write publicly about their struggles and successes in balancing work and life. Shortly after my 2nd son was born and I was just launching my startup, I wrote a similar post which I still look at today – http://www.instigatorblog.com/how-to-start-a-company-and-family-at-the-same-time/2007/07/11/. I think when we realize that we don’t have to be engaged with our startup 24/7 — that things can actually wait a bit, whether it’s email, a meeting, etc. — it opens our eyes to opportunities for better balance. Will skipping out midday to see a kid’s play at school sink your startup? No. So go do it. Thanks for this wonderful post. As you mature from “me” focus to “others” focused, I think it makes you a better entrepreneur. I feel that having a family makes me a better startup guy. It makes you better at working with other people, it makes you focus on the one or two things you MUST do and learn to ignore distractions to your business. 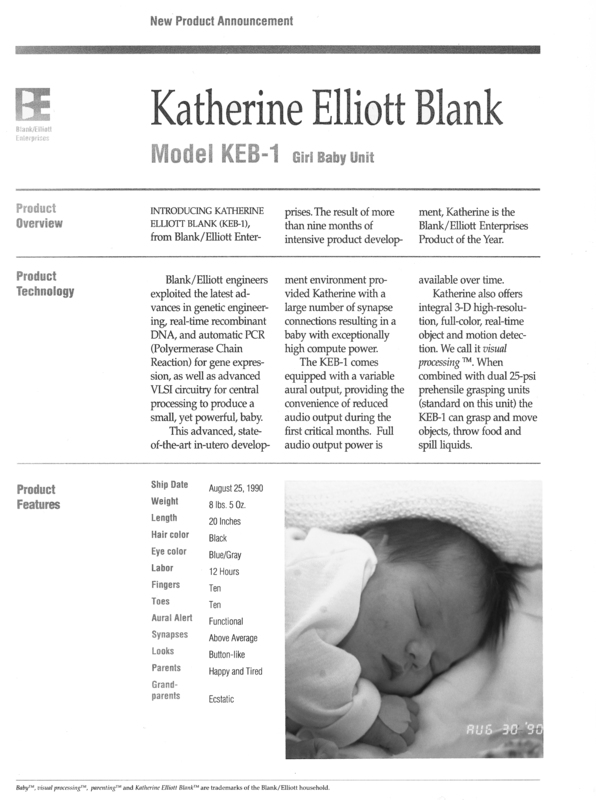 We just had our second baby, born right about 6 weeks before our (intended) product launch, so I appreciate this post. Also, I remember, fondly, spending saturday mornings at my dad’s office. I used to drive RC cars around the cubicles while my dad worked. Thanks for this post, Steve. I’m on my first startup (or 3rd, if you count 5yo and 3yo boys as the first two start-ups.) I’ve heard the “teaching her how to leave” message said in a different way: “You’re not raising a child, you’re raising an adult.” But I think I like your version better. Thank you so much for this article. I’m 3 years in on my first venture with 2 kids and you’ve outlined some fantastic, and very concrete, suggestions. I’m bookmarking this for future reference. As much as I love this article, I’d love to see a companion piece that outlines some rules for the married/parent/startup person wrt things you do for yourself individually. The family rules list is great, but what about things to nurture and keep yourself going as an individual? (e.g. carving out time to develop a new hobby/skill, frequent walks, recharging “me time”). I know you’ve probably got some thoughts on that as well and I’d love to hear them. Steve – a fantastic post. Coming back to the office 6 weeks after my son was born I’m still struggling with work-life balance but this helps put it all in perspective. Every professional ultimately has a balancing act to perform and I’ve come to realize it is a very personal decision on how to perform that balancing act. Thanks for reminding us that it’s not just about a relentless pursuit of an opportunity – that often times, we’re bringing a lot of passengers along for the ride. Great post. So much more inspiring than what jason calacanis writes. I stumbled across your blog on Hacker News and I’m really digging this series of posts. I’m in the middle of starting yet another company and have about 6 under my belt in one capacity or another. I wonder from time to time if we don’t over value “family”. Are there some of us out there who are just wired to find happiness and fulfillment through something other than procreation and homemaking? FWIW – For those of you wishing to disable the annoying Snapshots popups in this post (and every other blog you visit that has them), I recommend reading Giles excellent post http://gilesbowkett.blogspot.com/2009/01/protect-your-productivity-block.html. I’m an undergraduate currently interning at a Chicago-area startup. Just want to thank you for sharing the lessons and insights you’ve gained throughout your journey. You’ve done a nice job of helping me see how an entrepreneur’s mindset changes over time, particularly as family responsibilities emerge. Quick question: If you had understood working smarter at a younger age, where do you think you’d be right now? Thanks again and I’ll be sure to forward this post to friends. Honestly I’m not sure if I was wired for taking advice before I experienced the consequence of failure. Learning from my divorce made my next marriage work. Learning from my failure at Rocket Science made E.piphany work. However, I think if I had understood the basics of Customer Development I might have done 5-6 startups rather than 8 to get to retirement. Thank you for this. My husband and I are both entrepreneurs running two separate companies. I’ve often thought about writing a post about our daily juggling act. Even though we are both in the thick of it, I am still considered the primary caregiver (running home when needed or picking up early some days). As eventful as it can be sometimes, I am happier than I have ever been because I am doing what I love and I have a family, who supports me. I’m in the process of going through a divorce. I sent this blog post to my wife asking her to read it. I told her I wish I had read this a couple years ago. I hope you incorporate this blog post into all of your college courses. It will save a lot of people a lot of heart ache. I’m glad Maura broke the ice. My wife and I both work, and I wonder whether it’s possible for us both to find flow at work and at home. Raising a child (our first just turned 10 months) is a full-time job by itself. Overall things were not better back when satisfying work was often not available to women at all. But they were better in the limited sense that there was a sensible division of labor within the household so that most parents found a sustainable way to cooperatively meet each others’ and their childrens’ needs over the long haul. Balancing work and home life feels very ad hoc to me, and I think the reason is partly that there are no widely agreed upon expectations at work as to what responsibilities a man or woman has at home now. Everybody is constantly negotiating and renegotiating to find the right balance. We make liberal use of technology (sharing calendars with Google calendars and iPhone messages and calls) and outside help (housecleaning and gardening), and still it wouldn’t be possible without having both sets of parents nearby to fill in when necessary. It’s no wonder that so many families fall apart. steve – i’m hooked on this blog. great articles / write up! thx for sharing your experience. Reading your post has been extremely helpful. Thanks a lot for sharing your insights about work/life balance. One simple hack that can help you balance your work with your family is to take on the primary responsibility for picking up your kids from daycare/aftercare. I’ve always picked up the kids before 6 PM, which forces me to leave the office. Erecting a hard, consistent boundary trains the other people in your company to respect your schedule. Agreed. Consistency and boundary maintenance are key to getting cooperation from coworkers. I noted that Steve always took a three-week vacation. I am betting he took it the same time every year too. I know others who do this. There is less resistance when everybody expects it coming. It gives others a chance to plan around it. My wife and I started a family with a bag – 3 kids in 3 years. At the time I was well into my last startup and she really carried the load. We’ve since moved from Boston back to our hometown of Waterloo nearer to family and friends. Its made a world of difference and has topped up our emotional reserves. to this day I struggle to find this balance. In many ways I find I’m getting too caught up in the minute to minute often time wasting activities that are likely waste anyway. I’ve started to learn to be more ruthless with what I focus on and don’t allow myself unlimited time to pursue open ended activities. These posts about family/work _BALANCE_ really hit home. Now that I’m married I know that I can not pull 20 hour days without some sort of impact . Makes me think hard about how my first successful company was so dependent on constant attentive care and why I had not automated/simplified workflow (came down to having no other priorities). As we decide where we will settle down for the next 2-3 year project I must decide if I will relocate my wife and 6-month daughter to LA for a startup, or move back home where family and friends are and commute every 2 weeks across a pond. Past experience has told me that relocating to a big city for work can be isolating and depressing, but staying in a podunk town close to family may be even worse. Every time I’ve moved for work it has been empty. Either because expectations were not set right or when the venture has failed. Lots of things to figure out, but glad to know I’m not alone. Must read post for married entrepreneurs.. I think most folks assume that startups are a young person’s game, and that when you get to the point of having a family you’ve probably taken yourself out of the game. Fred Wilson had a post about the great companies all being started by people in their 20’s and it caused a big stir (even though a lot of the stats were in fact true). This is a really great road map of how to balance the desire to be a great entrepreneur while being an even better parent/spouse. What a great post! I’ve learned so much! This is one of the best work/life balance things I’ve read and one of the few that specifically address the issues from a startup perspective. I’m particularly impressed by your decision to recount the actual “policies” that you used. Solid gold for anyone involved in a startup or any entrepreneur. Thank you so much for this post. I have two children just starting school and have been afraid that I can’t do the start-up I want to because it would be too hard on my family (I’m the mom!). I have told myself that it’s all about the systems and working smarter — but there are very, very few people out there willing to role-model “having a life while doing a startup”. The tech industry continually holds up the 18-hour-day as part of the deal – if you don’t do it you’re a bit of a loser. It helps a lot to know that other deals are really possible and not just an idealistic dream of mine. Nice post. People in Silicon Valley need to get their priorities straight. Now if all startups played by the ground rules of actually having a life and a work balance, everyone would be all the better – youngsters in their 20s and those in their 30s starting families. Maybe this recession will reset people’s values right and find a new normal that we can all live within our material and mental sanity means. I’ve not been involved in a startup, but into the first 20 years of marriage, 2 kids and full time jobs my husband and I managed to squeeze 15 years of undergrad, graduate and doctorate work. The boys are 24 & 21, the marriage just hit 26 years, the happiness continues! Your list is very close to the one we made on our journey – especially dinner-bed time, date nights, and including each other. We discovered that our most valuable tool was time the 4 of us spent talking about what in our schedule was working, what wasn’t working – and always how we could make it work better. We all communicated constantly for our family’s greater good. I would do it again. Thanks for writing your thoughts on work/life balance. Your observations are life lessons hard earned. I have a daughter (now 8 years old), and I know that it takes commitment to stick to a sane/balanced life. I am a young entrepreneur who is thinking about how to divide time between work and family (when I have one), and I found your post to be a great framework for thought. This is the first post I have read on your blog, and it gives a great impression. Kudos for writing about this. Thanks for the excellent article, we are grateful for it. It is a good goal for any parent, particularly working. Appreciate the links to picnics, trips. Steve, once you had kids, did your wife keep working? Great question and one we struggled with yearly. The short answer is no. She didn’t go back to work until they were teenagers. We lived a less extravagant life then some of our friends on my struggling entrepreneurs salary because we chose to cut back on what kind of physical goods we had (house, cars, vacations,) in exchange for having her home with our kids when they were toddlers and home when they got back from school when they got older. Watching her drive the kids around and managing their activities seemed like a full-time job to me. She also got much more involved with their education than I was. Not only was she president of the board at their school, she was on top of the inevitable problems that crop up in kids – learning differences, school choices, etc. At times I thought I had the easier job. None of the above are suggestions or recommendations, (and just might not be possible for others) just the choices we made. Such a great post. Thank you. I just read it to my wife and we can really relate to having to set rules and boundaries to maintain relationship with each other and with our kids. It’s not easy. A couple questions we had was did(do) your kids share your entrepreneurial spirit? And if so did you do things as a family to foster that spirit? We’d love to foster what seems to be a growing interest in our own kids being little entrepreneurs, without creating stress of course. 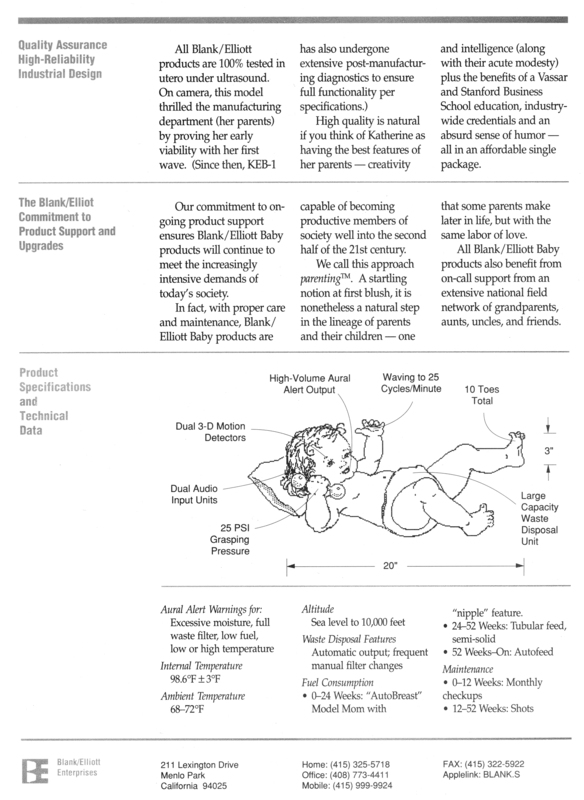 Given they had a more stable childhood then I did https://steveblank.com/2009/05/18/founders-and-dysfunctional-families/ one potential source for entrepreneurial drive was eliminated. My two cents: Kids interests change rapidly as they grow and try on different “who am I and what do I like” hats. Make sure you aren’t overenthusiastic too early or they’ll start doing it to please you. Then as they get older they’ll get tired of doing so later. If they are still interested in businesses in high school that’s the time for you to take a serious interest. I like your answer Steve. Don’t be overenthusiastic. I love what I do, I’m enthusiastic, but I don’t want to pressure my kids into something that may develop naturally else I may hinder that process. I’ll wait for the signs of interest and then encourage, help, and mentor as they need and as they want. 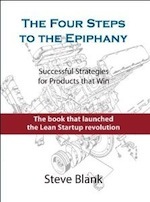 I’m also now reading your book The Four Steps to the Epiphany. I’m just 25 pages and really absorbing your experience. 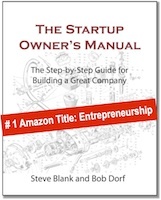 I’m not sure I’ve read a book for the entreprenuer and startup, in my 15 years of doing it, that so well lays out the process NOT to follow and the process TO follow. Very nice. You seem to have extreme energy. Working for 8 hours at your desk, then playing with your kids, then working another 4-5 hours at night???? How have you accomplished this? Are you Superman? Frankly, could you write a blog post about how you could cope with such a gruelling workload? Just extreme interest and curiosity in things I was working on. As an entrepreneur who’s first company just filed it’s S-1 and who is just starting the process of launching another while his wife is pregnant, I found this post poignant and personally very useful. I hope that you and I will get a chance to meet in person sometime in the future. I’ve found your writing (from 4 steps to the blog) really helpful.. in fact, I’m using your book and the approach you use in your Stanford classes in a seminar class I’m going to teach at Yale next year. Thanks for being such a great thinker and advisor to the startup community! Thank you for sharing your experienced. this post is great. My “second life” – i’m divorced too- is organized exacty as you mean, wife works home, I works home- a part some “one day trip” and 1 month/year in Silicon valley…It works, I’m happy. I was doing some research for a panel discussion I’ll be taking part in soon, and I stumbled across this series of posts. While this is a conversation that is active and never cliche in the mompreneur world I move in, it’s the first time I’ve heard it so clearly spelled out by a dad. Your wife and kids are lucky. My favorite gem in this post? The idea of taking a video of your kids every month, on the couch, for 16 years. What an incredible way to show them you care about them. And then to present the videos as a time capsule of their life? That’s priceless. this is a great post and it rings true on so many levels. You’re a true source of inspiration. I can’t wait to read your book. Please keep delivering hope to mortals like me. I’m running my second startup after a failed one, and at the same time trying to balance social life and work. Thank you so much Steve. I came across this post randomly via Twitter and it has totally shifted the perspective of my entire day. I am only 28 but have wrestling with whether or not to dive back into Startup City after getting married late last year and this has totally given me a new perspective on the issue. I want my wife (and hopefully, children) to be as proud of my achievements as my peers. Many thank for your post and thanks for sharing tips. I am a husband and a father of two kids. I am trying to become a successful entrepreneur. And many times I can’t mange time among work, family and school. Your post gave me valuable tools and technique which I am planning to embrace. Like you I come from work around 7 pm and spend time with the family until kids go to bed. Then again go back to work. But many time I can’t keep up with kid events and birthday parties. After reading your post I think it is possible. This was so important especially for me, because Iam just starting up my company and family. Thanks for pointing me to this, Steve. It helps to put things in perspective and also lowers the burden of guilt that I sometimes feel when I am spending time on myChef versus with my boyfriend/family and vice versa. I’ve created some similar rules for myself but they are not so robust as we don’t have our own family yet! Thanks for mentioning this post this evening. Very poignant for me. I’ve got 10 year old twin girls. They are growing up and I’m busting my chops with work. I focus on turning off my work mind when I get home…now. But, there were a few years where I sure didn’t. Most of the Dad’s are making some one else rich at the cost of family. Great post !!! I unexpectedly happened upon this post and was compelled to reply. You received spectacular advice in “prepare them to leave” and evidence of your success is on your daughters faces. If everything else tanks tomorrow you will have done very well for yourself. Odd. It works for me now too. Before it was only showing the comments and none of the content of the post. My apologies for the false alarm.